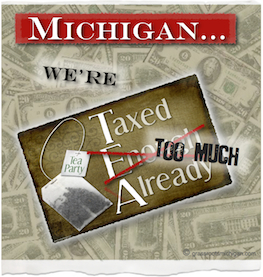 When will Republicans in Lansing stop colluding with Democrats to pass new taxes?! Republicans were swept into office in 2010 in historical numbers largely due to the Tea Party. We reasonably expect them to be accountable to a platform of low taxes and less government. And to no? expansion of government power WITHOUT public input and transparency. NO expansion of government power WITHOUT public input and transparency. There are ways to fix Michigan’s roads without new taxes and government expansion. For example, warranties on road construction and sales tax on gas going to roads. Yesterday was the first Committee Meetings on a number of bills. We need to be pro-active as groups and associations in favor of tax increases were out in force testifying. Most people work during the day and can not attend them meetings so that is why its critical for you to call your Rep and if possible e-mail members of the Committee. HB 5477 (Rep. VerHeulen -R) Transportation; motor fuel tax; motor fuel tax; modify. And of course when suppliers are taxed who do they pass the costs down to?! agricultural, or industrial processing purposes. So senior citizens on fixed incomes are being taxes to stay warm! HB 4925?? (Rep. Lane -D) Transportation; other; public-private partnerships; allow the state transportation department to enter into. Apparently, HB 4925 is a backdoor attempt WITHOUT public input for toll roads! Fits right in with Obama’s plans! Sometimes they try to say (despite what the bill says) that there are federal limitations that would protect us. This is lip service, as the federal government is getting ready to change those limitations. And this bill might not just be about revenue for roads. Courts have found that states are free to use tolls in any way they want. Short of dedicating the money to roads in their constitutions, States can use tolls for the road being tolled, use the tolls for a road on the other side of the state, use the tolls for high speed rail costs, or use the tolls for schools, etc.. This is therefore NOT a user fee 99% of the time. It is also not about money but also about control. HB 4630 (Rep. McCready-R)? Vehicles; registration; registration fees; modify. 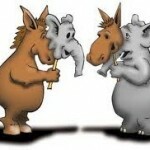 House Bill 4630 (H-2) and House Bill 4632 (H-2) are tie barred to each other. Own an RV? Lots of people do. I do. A trailer has one time permanent registration tax. Not if this bill passes. House Bill 4632 (H-2) indicates that trailer plates issued prior to the effective date of the enacted bill would expire 10 years after the effective date of the enacted bill.? Plates issued after the effective date of the enacted bill would expire 3 years after the date of issuance. The bill indicates that registration plates issued under the subdivision is not transferable. House Bill 4630 (H-2) would increase the registration fee to $90.00 for both historic vehicle plates issued by the department and authentic registration plates, from $30.00 and $35.00, respectively. Section 803 currently provides for a $10.00 fee for each plate. House Bill 4630 (H-2) would increase the plate fee under this section to $20.00. Under current law, the application fee for original operator’s licenses is $25.00 and for renewal operator’s licenses, $18.00.? However, if the operator’s license is expired at the time of renewal, the renewal fee is the same as the original fee, $25.00.? In effect, late renewals are subject to a $7.00 penalty. HB 5167 (Rep. Schmidt – R)? Transportation; funds; contracts entered into by state transportation departments and local road agencies; change bidding requirements and allow state transportation department to borrow money from local road agencies. New authority with undefined terms and non-competitive bidding with what private contractors? Palm greasers? ?All construction projects of the department or a local road agency concerning highways, streets, roads, and bridges for construction or preservation as defined in Section 10c shall be performed by contract awarded by competitive bidding unless the department or the local road agency affirmatively finds that under the circumstances relating to those projects, some other method is in the public interest. The term “award” with regard to contracts would appear to be specific to competitively bid contracts. It is not clear what the term “award” means with regard to projects performed under force account by local road agencies. Authorize the department to enter into agreements with local road agencies or a private sector company to perform work on a highway, road, or street, including maintenance, engineering services, and the acquisition of right of way. The fiscal impact of the …proposed amendments to this subsection cannot be readily determined. HB 5452??? (Rep. McCready -R) Traffic control; traffic regulation; permit fees charged by state transportation department for vehicles excluding vehicle weight or size limits; modify. House Bill 5452 would double MDOT oversize/overweight permit fees. HB 5453 (Rep. Kosowski -D) Traffic control; traffic regulation; traffic fines for overweight and oversized vehicles; increase. Generally speaking, the bills aim at providing higher civil fines for length, height, and weight violations.? HB 5460? (Rep. Lauwers -R)?? Highways; construction and repair; replacement warranties on road repairs; modify, and extend warranty requirement to local road agencies. House Bill 5460 would amend Public Act 51 of 1951, the statute that governs the distribution of Michigan Transportation Fund (MTF) revenue.? The bill would require the Michigan Department of Transportation, county road commissions, and cities and villages to “secure warranties for full replacement guarantee for construction and preservation projects.”? The bill would also require county road commissions and cities and villages to include warranty information in the biennial road or street reports required under Section 14 of Act 51.? Specifically, road commissions and cities and villages would be required to include a list of all road or street construction and preservation warranties, and indicate whether any of the listed warranties were redeemed. HB 4251?? ?(Rep. Cotter)?? ?Counties; boards and commissions; requirement for competitive bidding by county road commissions on certain projects involving townships; provide for. The bill would specify that if a township contributes 50% or more to the cost of a road project, the township board could, by resolution, require that the county road commission contract for the work on that road project through competitive bidding.? Under the bill, a county road commission would not be prohibited from submitting a competitive bid. If a township board requires a county road commission to contract for work on a road project through competitive bidding, the county road commission would be required to submit both the competitive bid process to be used and the final contract for that project to the township board for approval.? Before the county road commission submitted the final contract for the road project to the township board for approval, the road commission would be required to submit to the township board a copy of each competitive bid it received for that road project. Powered by WordPress and the 예스카지노 가입쿠폰.